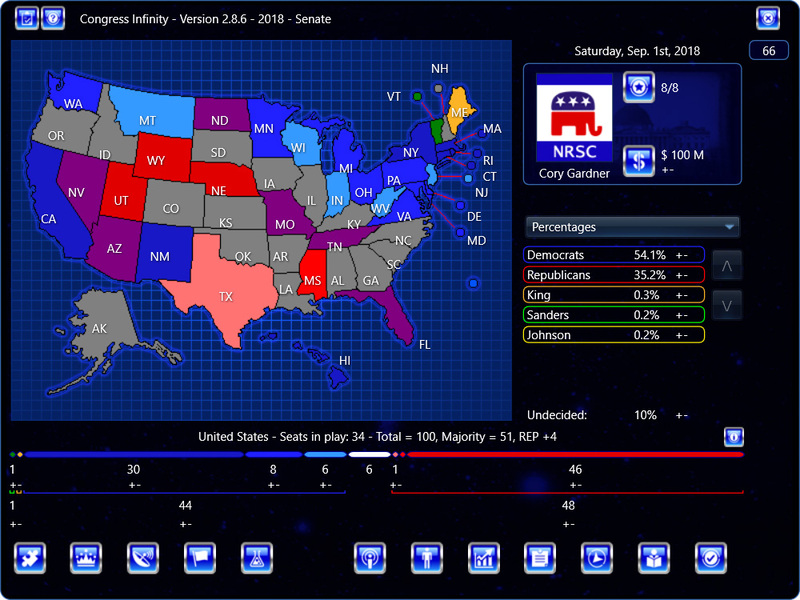 Congress Infinity v. 2.8.6 for Windows and Mac has been released! This adds ‘Supreme Court Nomination’ as an issue in the Senate 2018 campaign, adds events to the Senate 2018 campaign, updates House 2018 issues, shows regional info on the map without having to click, allows for increasing the size of windows (for high-resolution or high-DPI displays), and more. Congress Infinity is the focus before the mid-terms, President Infinity will be the focus after the mid-terms. Great update, the mouse over map feature is a really nice addition. I was wondering is there a way to create your own candidate(Policy,avatar picture, money they have, etc) And if there isn’t do you guys think it would be a good idea to create something like this? Do you mean a local candidate in Congress Infinity? You can set the name and strength in the Editor. You can edit all aspects of a candidate in President Infinity with the Editor. Anthony, will you be adding all the candidate names for each house district? Just ran a simulation of the House scenario with 100 runs and the end result was Republicans 0 wins and Democrats 76 – given there’s only two parties, the GOP must have obviously won the other 24 times so there’s a tiny bug there, I guess. Thanks for this – sounds like a bug. I suppose it’s possible there were ties, but that seems unlikely. I’ve noted this for testing. Local candidates are already in all the House 2018 campaigns. If there’s an error somewhere, please let me know.